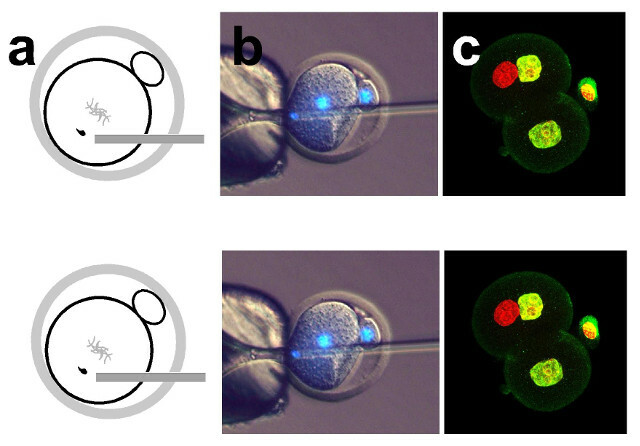 Diagram showing sperm injection into a one-cell embryo in the phICSI method (a); microscopy (with DNA stained blue) of sperm being injected into a one-cell mouse embryo, which has a diameter of about 0.1 mm (b); some of the resulting two-cell embryo cells have a sperm-derived genome (red) and an egg-derived one (yellow), which can develop to form offspring (c)UNIVERSITY OF BATHWhen a sperm fertilizes an egg, it transforms from a fully differentiated cell into half the genetic material of an embryo. This transformation is called reprogramming. For centuries, scientists thought that only eggs could effect this change in sperm, University of Bath biologist Anthony Perry told The Scientist. 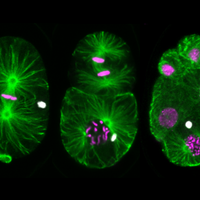 For the first time, Perry and colleagues have created viable mouse embryos starting not with eggs but with mitotic cells, they reported in a study published today (September 13) in Nature Communications. Many of these embryos developed to term; the resulting pups were healthy and, later, able to breed viable offspring themselves. The researchers started with parthenogenetic embryos: oocytes that had undergone meiosis and were chemically coaxed to begin normal cell division despite not having been fertilized. 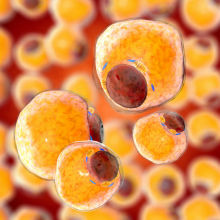 At about 13 hours after the chemical treatment (the time at which the cell replicates its DNA and prepares for its first cell division), the researchers injected the parthenogenetic oocytes with a sperm (via intracytoplasmic sperm injection, or ICSI), each containing a haploid genome. As the cell cycle progressed, the embryo divided into two cells. There were several possible ways that the chromosomes could be apportioned between the two cells. The researchers selected the two-cell embryos in which one cell received one set of chromosomes from the parthenogenetic embryo and one from the sperm, as those were the only ones with a chance of survival, Perry said. The researchers then destroyed the second cell. Embryos created this way were called “phICSI”—parthenogenetic, haploid intracytoplasmic sperm injection. 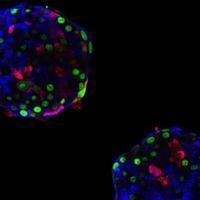 The researchers next implanted a phICSI embryo into a pseudopregnant female mouse. As a control, researchers performed ICSI on oocytes at metaphase II of meiosis, which is when fertilization normally occurs. That fertilization then set the control embryos on course to divide and develop. At the two-cell stage, the researchers destroyed one cell of each ICSI embryo. Next, the team implanted the phICSI and ICSI embryos into pseudopregnant animals. Of the phICSI embryos, 10.4 percent survived to term, whereas 43.4 percent of the ICSI embryos did. The researchers also injected sperm at seven and 10 hours after chemical activation, finding that those embryos were much less viable. Clarke noted that in both metaphase II of meiosis—when ICSI embryos were injected—and in metaphase of the first cell division—when phICSI embryos were injected—the nuclear envelope has broken down so that proteins like histones that live in the nucleus and are necessary for reprogramming sperm spill out and are available to the cells. “The sperm has access to those proteins at metaphase of meiosis, which is the normal time, and once again at metaphase of mitosis, which is [Perry’s] innovation,” Clarke said. This histone-protamine replacement occurred as usual in phICSI embryos, the researchers reported. But reprogramming also involves other epigenetic changes, and those were different between ICSI and phICSI embryos. For example, levels of H3K9 dimethylation were lower in the maternal chromatin of phICSI embryos, said Perry. The phICSI embryos that developed to term tended to come from the phICSI embryos that had epigenetic modifications that were different from those of ICSI embryos, he added. “The fact that normal and fertile mice can develop is surprising, because so many epigenome-level events take place differently in this case than when sperm is injected into an MII [metaphase II] oocyte,” Piroska Szabó, who studies developmental reprogramming at the Van Andel Research Institute in Michigan and who was also not involved in the work, told The Scientist in an email. Clarke disputes that. “Here, they added a paternal genome to the parthenogenetic embryos and only then obtained development to term. So it does not at all challenge the dogma that both a maternal and a paternal genome are needed for embryonic development in mammals,” he said. Going forward, the researchers intend to investigate this sperm reprogramming machinery and determine whether it is different in oocytes and in parthenogenetic embryos undergoing mitosis, Perry said. T. Suzuki et al., “Mice produced by mitotic reprogramming of sperm injected into haploid parthenogenotes,” Nature Communications, doi:10.1038/ncomms12676, 2016.